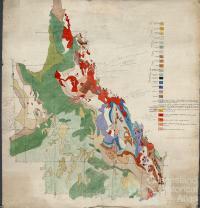 The 1928-29 map ‘Preliminary plot of Queensland section of Geological map of the Commonwealth of Australia’ is a good illustration of the state of the technology of map creation at the time that it was drawn. In the early part of the twentieth century it was common for the geologists to record their observations on a base such as a cadastral or topographic map, and after gathering enough information they would attempt to put boundaries around geological units. Eventually this compilation map would be passed onto a professional cartographer to create the geological map. The exact history of this map is uncertain. However, from studying Queensland Government reports from this time, looking at older maps, as well as the completed map of the Geology of the Commonwealth of Australia, published by Edgeworth David in 1931, we can piece together why this map was most probably made. In 1928 Edgeworth David embarked on an ambitious scheme to compile a geological map of the Commonwealth of Australia, which would become the most detailed geology map in the world for the scale that it was printed. No one person could know the geology of the whole of Australia, but fortunately, all of the states had Geological Surveys. The main aims of the Geological Surveys at that time were to evaluate mineral fields to ensure the economic viability of their states, but they also mapped the geology as they conducted their work. Therefore, Edgeworth David contacted Benjamin Dunstan, who was the Chief Government Geologist in Queensland at that time. Dunstan and several other state geologists pooled their knowledge and sent Edgeworth David their interpretation of the geology of Queensland, which David added to his compilation map. The geological interpretation that Dunstan forwarded, and which is probably depicted in this map, was very similar to the 1905 Geological Sketch Map of Queensland, though there were some improvements made in areas where the Geological Survey had been working, such as around the Gympie Goldfields and the Permian Bowen Basin. We believe that the map sent by Dunstan to David is the map ‘The Geological survey of Queensland, 1928-29’. Just below the legend, written in pencil is a note that the map “is largely based on the Geol Sketch map of Qland (B. Dunstan) 1905 but chief alterations refer to” and then lists the areas that have been improved since 1905. Compiling the data probably highlighted to Dunstan that the 1905 Geological Sketch Map of Queensland was out-of-date and he assigned J.H. Reid to begin compiling a new map. 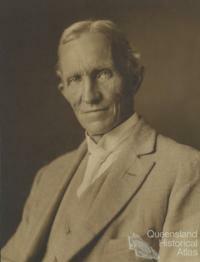 Much of 1928 and 1929 were spent by Reid and others referencing numerous reports and maps and compiling it all into a new geological map of the state. In late 1929, with the Geology of the Commonwealth of Australia approaching completion, the Federal Government told Edgeworth David that final approval to publish his map would require the written approval from the director of each of the state Geological Surveys, as well as the approval of the Federal Geologist. David’s compilation maps would have been very hard to replace, and he would not have wanted to risk losing them, therefore he traced his compilation of the geology of Queensland onto a blank sheet of paper and hand painted it to create a legend showing the ages of the different rocks. He could safely send this copy to Queensland without any fear of something happening to his original compilation. The copy was sent to Ball, who had become the Chief Government Geologist for Queensland. The hand-drawn and painted copy is the one depicted. It contains numerous penciled annotations, possibly by the Queensland geologists or perhaps by David himself. However, by this time the Geological Survey of Queensland had finished compiling the geology of the state and this was forwarded to David, and was used in the 1931 Geology of the Commonwealth of Australia map. 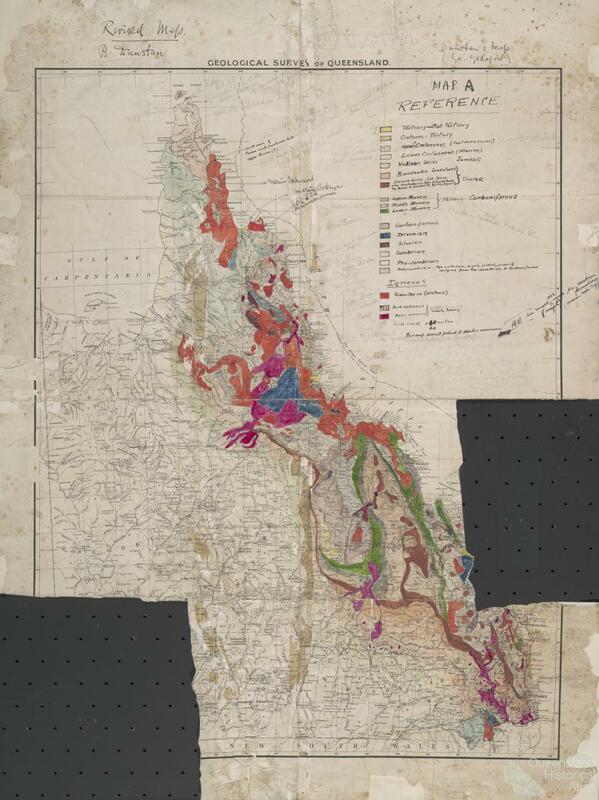 The depiction of the geology of Queensland is significantly different to the one that David initially compiled and set to the Geological Survey of Queensland for comment. During the year 1930, under Mr. Dunstan’s direction and supervision and with the co-operation of the full staff, a revision of the 1905 Geological Map of the State was begun by Mr. J.H. Reid. This was undertaken at the special request and with the active collaboration of Professor Sir T.W.E. David, to whom it was passed over for adjustment with the maps of the other State surveys. My own contribution to the new map comprised traverses in all parts of Queensland during the last thirty years.